You might think that a website like Liquidation.com would balk at the suggestion that it is, "the eBay for wholesale liquidations." Considering the comparison, it is a heavy statement. However, the description is right on the money, especially considering how the online auction destination has grown since being founded just a few years ago. Sales for its parent company, Liquidity Services, Inc. (NASDAQ: LQDT), have seen an annual compounded growth rate of 37 percent over the last 5 years, while commercial sales have surged 137 percent in the last year alone. "We have grown our buyer base by 46 percent each year since 2003," said Bill Angrick, Chairman and CEO, Liquidity Services, Inc. (LSI). "Last year, we completed more than 210,000 transactions and over $234 million in gross merchandise sales. We continue to expand the breadth of our products and services offerings, because our clients are business customers that we want to take care of and help succeed in their own right." "So, yes, the eBay comparison does fit," said Angrick. "But unlike eBay, we provide a complete solution for buyers to pay for their transactions and ship their goods. Our system produces a shorter sales cycle for sellers. If left to their own devices, it would take them far longer to prepare the items for sale, while doing such tasks as calling and qualifying potential buyers, handling buyer questions, collecting payments, arranging shipping and maintaining a technology platform." Liquidation.com provides buyers with quick access to products from hundreds of commercial sellers, including over 30 Fortune 500 retailers and manufacturers. For instance, while taking advantage of the open market competition that is the essence of an auction site, buyers are able to determine prices and ultimately find incredible bargains. Meanwhile, sellers are able to leverage the same kind of competition among buyers, to get the cash they need from their surplus, overstock items and customer returns. The supply of merchandise offered to buyers on Liquidation.com is snapped up quickly throughout the year, because its sellers have a continuous need to unload store returns and overstock goods at below wholesale cost, to recoup working capital. "Our original goal was to develop the largest and most efficient online marketplace, enabling customers to transact wholesale and surplus goods," Angrick said. "We are proud to say that with over one million completed online transactions, our team has made this goal a reality." There is no question that accomplishing goals is one of the keys to any burgeoning enterprise. How exactly has LSI been able to pull off the major success that is Liquidation.com? The company has an enormous volume and variety of goods for buyers to purchase, from over 600 product categories, in lot sizes ranging from case packs to pallets to truckloads. Virtually all of Liquidation.com's online auctions start with a low reserve, and contain a detailed manifest and digital photographs of the merchandise, to enable more informed purchasing for its buying customers. LSI has negotiated volume discounts with shipping companies to provide buyers with attractive shipping rates, which makes sourcing goods through its marketplace a better value. Buyers can conveniently track their shipments through the website backend. Once a transaction is completed, as Angrick suggested, LSI performs each required post sale step for the seller, such as payment collection, settlement and reporting. Without question, the company believes these services provide buyers with a more secure transaction environment and a heightened assuredness in the goods that they purchase. It's little wonder why Liquidation.com's over 685,000 registered buyers have become ardent fans of the site. "We have seen transactions start with an opening bid of $100 and close for $4,000 or $5,000," Angrick explained. "Product wise, we sell almost every non-food item that big box retailers offer, including brands like Walt Disney, Dewalt, Stanley, Apple, iPod, Toshiba, Harry Potter and other names that drive retail business. Another important advantage for buyers is that the website is easy to use and time efficient for the user." Liquidation.com saves buyers time by leveraging a terrific supply of attractively priced and unique items in a single marketplace. At the site, buyers are provided with access to detailed product descriptions, digital images, seller transaction histories, shipping weights, dimensions and estimated delivery costs. Further, this marketplace provides access to an ongoing flow of desirable assets in numerous categories, including apparel and accessories, consumer electronics, general retail merchandise, hardware, building tools and jewelry. Searching for items at www.liquidation.com could not be easier. The site intelligently employs five drilldown menus (Product Category, Location, Lot Size, Condition, and Shipping Option) that help viewers zero in on the products they need. In the example of the Condition category, every item is listed as either New, Refurbished, Shelf-Pulled, Used or Returned Merchandise. "We have added new features to make it even easier for buyers to find items of interest," Angrick said. "For example, we have introduced online tutorials to educate our customers. These help them learn how to configure their bid and shipment. The definitions for each category and subcategory are included in the tutorial. Our metrics show that our customers are using the tutorial and benefiting from it. But it is just one aspect of what we offer. Our customers can pick up the phone and speak toll free with one of our knowledgeable buyer customer service reps. In addition, we strive to respond to all email inquiries within 24 hours." When it comes to LSI's overall CRM and order fulfillment management, it operates six distributions centers, totaling over 400,000 square feet. They are located in Cranberry, NJ, Indianapolis, IN, Dallas, TX, Las Vegas, NV, Fullerton, CA and Sacramento, CA. It is worth mentioning that one of the best tools at the website involves allowing buyers to search for merchandise by each facility with the "Location" drilldown option. "All of our facilities are located in the natural logistics hubs in the United States," Angrick said. "The locations were chosen to minimize the cost of shipping for our buyers and sellers. And, the facilities make it easier for us to showcase a larger selection of products." Whether the marketplace exists online or offline, facilitating convenience is a must. To make things easy on registered buyers, Liquidation.com's marketing team sends buyers customized emails to alert them whenever new products get displayed for auction that match a buyer's expressed interests. Buyers are able to create custom searches of the site and have the results automatically sent to them. Liquidation.com also publishes regular Buyer Newsletters, which normally feature 8 to 10 items that are represented by photos, prices and availability. Most importantly, the emails also include when the bid times end for each individual product. At the bottom of the messages, one can find other currently inventoried products that are arranged under one of 8 major categories. Hotlinks allow the viewer to easily click through to learn more about the products and to purchase them. Readers can sign up for the email list by typing http://web.liquidation.com/joinlist/ into their URL box. From there, LSI only requires an email address to begin receiving the alerts. "We are a one-to-one marketing firm," Angrick said. "We deliver information to our buyers that is both relevant and timely. Technology is a great enabler for this idea in both directions. For example, buyers are able to access tailored information each time they click through an email and visit our marketplace, and we also utilize a variety of opt-in channels to push information to our buyers to keep them informed." 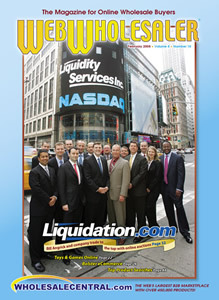 What's surprising about Liquidation.com and its success is that it is just one part of Liquidity Services, Inc., based in Washington, DC. LSI also operates www.govliquidation.com, an online auction marketplace for the sale of federal government surplus, and www.gowholesale.com, a wholesale search engine which lets businesses search for products and services to help grow their own business. Each of LSI's online arms is successful in its own right. Truth be told, the story behind LSI's fortunes with all three websites starts with a tough decision the firm made back in 1999, when it hired its own department of software engineers to develop a unique online marketplace infrastructure. Instead of lazily settling for commercially developed, "auction software," Angrick and his team created a system for wholesale buyers, devised by people who understood the needs of the industry. "We had to question what was more important: to be first to market or have a system that effectively services this unique marketplace," Angrick explained. "We elected to develop a custom online marketplace tailored to the needs of business buyers and sellers. In retrospect, it was an important move on our part. It gives us an advantage, as our customer experience is much better." Since then, the team of engineers and the rest of the firm's sales, marketing, operations and CRM staffers have developed a culture of open communication and continuous improvement. Overall, Angrick said, grand strategic visions by executive management can be overrated, and his company's growth is based on his team's ability to focus and execute daily for customers in every facet of business. "Fundamentally, a culture is what drives behavior," he explained. "It is integral to have open communication about what is working well and what requires improvement. We are still a relatively small enterprise, and our team members have a significant impact on our growth and success. You need to encourage them to take risks, but also to learn from each other. No one here is afraid to ask, 'Can we do things better, faster and more effectively for our customers?' We set goals, follow up and measure how we are doing. At the end of the day, the ultimate boss is the customer, and everything flows from there." Apparel & Accessories: includes brand name men's, women's and junior's clothing and fashion accessories. Consumer Electronics: brand name products for digital cameras, LCD and plasma TVs, gaming stations, PDAs, GPS units and audio and video equipment. General Merchandise: housewares, appliances, brand name toys and games, recreational and fitness equipment and sporting goods. Hardware and Building Tools: brand name home improvement tools, lawn and garden items, lighting products and plumbing. Technology Hardware: brand name laptops and desktop PCs, monitors, wireless devices, printers, home office devices, copiers, servers and routers.